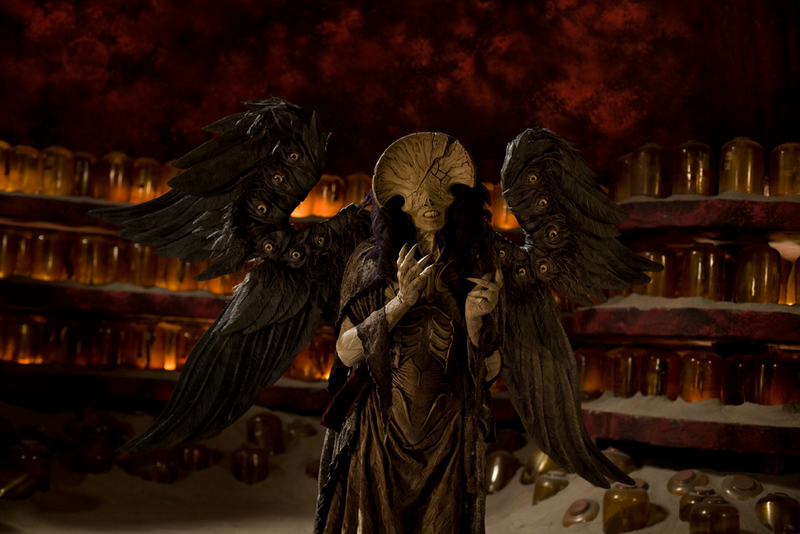 Compared to other creatures in the film, the design process for the Angel was relatively linear. “It was really true to the initial design that Guillermo wanted and it didn’t go through many changes,” said Mike Elizalde. “It was just a winning design that really struck a chord both aesthetically and in the storyline.” Cabrera was the first choice to helm the design. 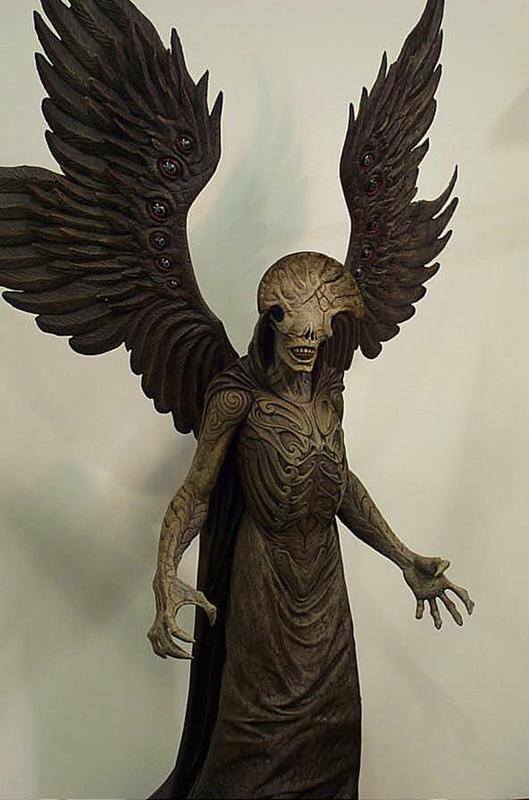 He related: “Mike and Guillermo had always intended for me to do the Angel of Death,” said Cabrera, “and in talking with Guillermo, I was really excited, because he basically said, ‘Think of every angel of death you’ve ever seen in movies and don’t do that! 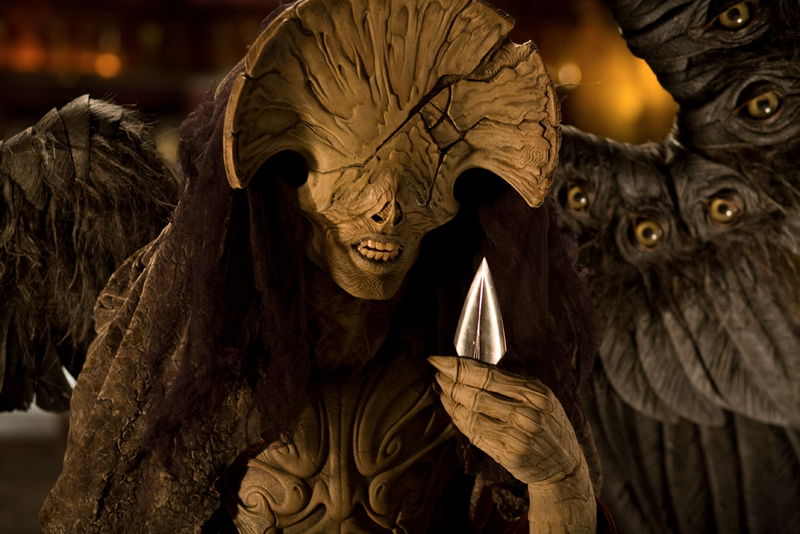 Do something that is really out there and bizarre.’” Guidelines included the fact that Doug Jones was to play the character — and that it had to be entirely practical, without digital modifications. As for the hands, “we wanted to have these long claws, almost like talons, so he doesn’t have fingernails but the tips of his fingers are really sharp as though they grew into these talon things,” Cabrera explained. Once finalized, the Angel design was translated to full size. 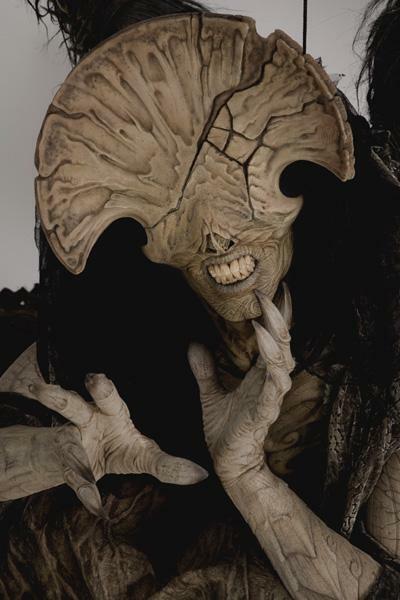 Cabrera sculpted the body portions that would be applied on the performer — such as facial appliances, gloves, and a chest piece — on a life cast of Doug Jones. The make-up was applied by Thom Floutz. 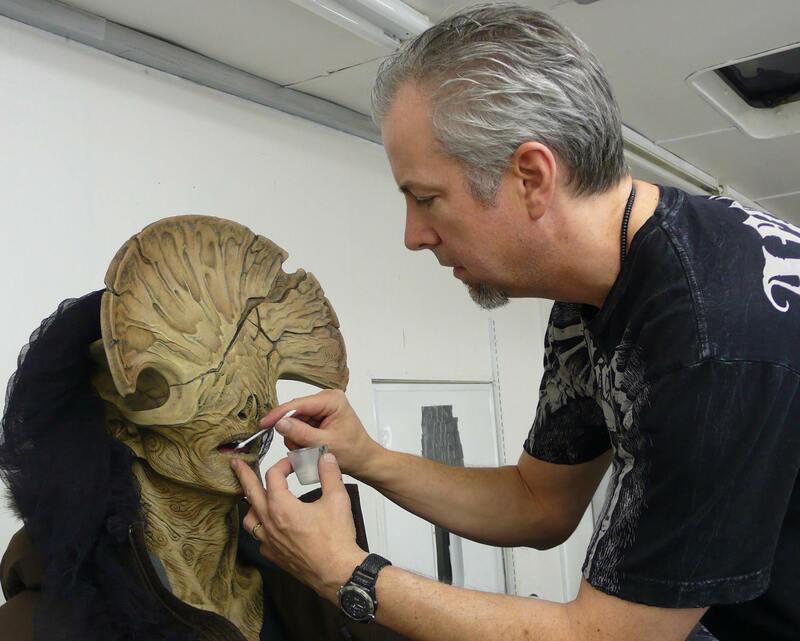 Similarly to Abe Sapien, the Angel make-up involved a vacuform piece that flattened the performer’s nose. 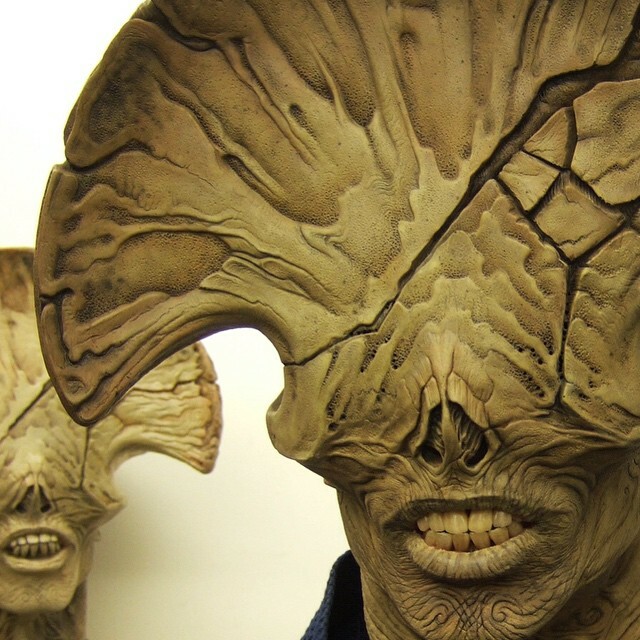 The fiberglass headpiece blended in with the foam latex make-up covering Jones’ mouth and lips. Dentures with teeth slightly jutting out completed the appearance of the Angel’s face; Jones could only see through two imperceptible, sculpturally-hidden slits in the headpiece. Just as they were during the design phase, the wings also proved to be a challenge to build. They had to house a large number of functions and yet be light enough for the performer to wear. All the wing mechanisms were devised by Mark Setrakian, Scott Millenbaugh and Bud McGrew. The wings could fold, unfurl and flap — through knee-like gears — and the eyes on them were designed to change angle as the wings extended or retracted. “The eyes were placed on mechanisms that allowed them to rotate in relation to the wing movement and remain parallel to the ground,” said Elizalde. “Regardless of the wing position, the eyes remained level; and all the eyes could look around in unison or individually. 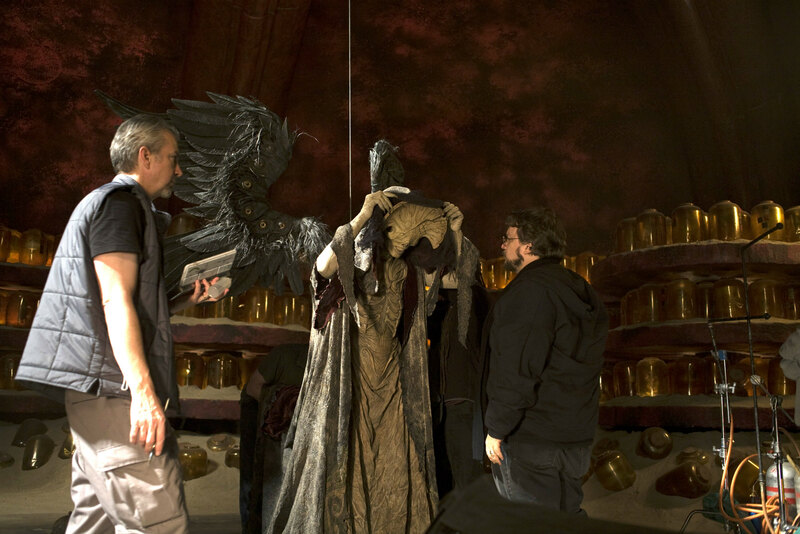 To give it a little extra touch of magic, Mark Setrakian also incorporated a [software] that would make all the eyes blink sequentially, creating a cascading effect.” The wings were covered in polyvinyl feathers with wire armatures to keep them stiff; the feathers were crafted and mounted on the animatronic wings by Fred Fraleigh. The performer could wear them like a harness. 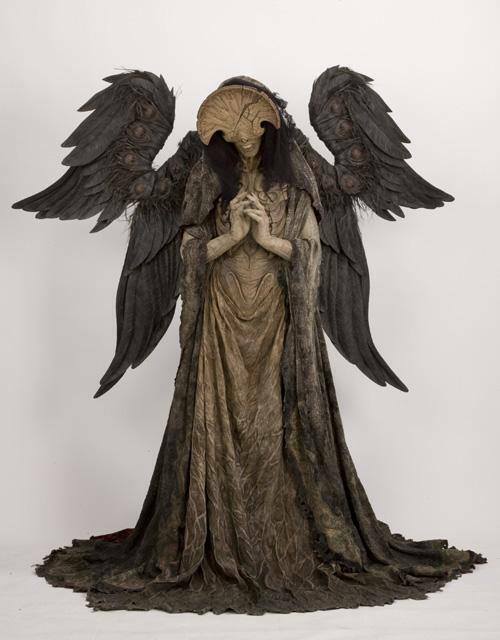 The appearance of the Angel was completed by its bride-like veil and robe, devised by costume designers Carol Jones and Claudia Hardy. 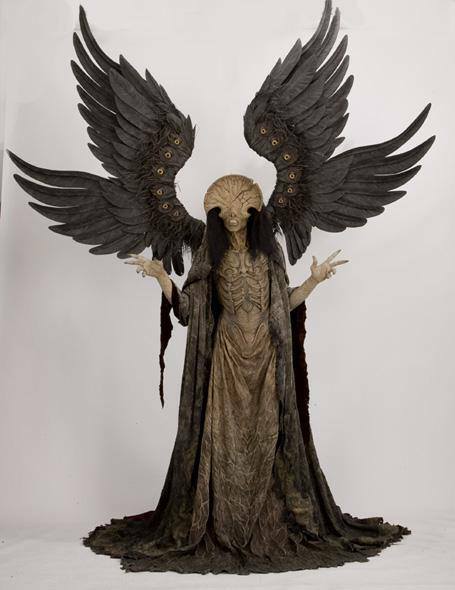 “I worked with them,” said Cabrera, “and said, ‘I want this to look like dried, cracked skin!’ so we did a bunch of tests and they really did a phenomenal job of articulating what the maquette looked like.” Since the Angel’s lower body would be entirely covered by the robe, this allowed Jones to wear leg extensions that increased the character’s height — making it more imposing. On set, Jones was partially supported by a wire that took off some of the weight of the animatronics — allowing more freedom for the performance, which incorporated ballet-like movements. 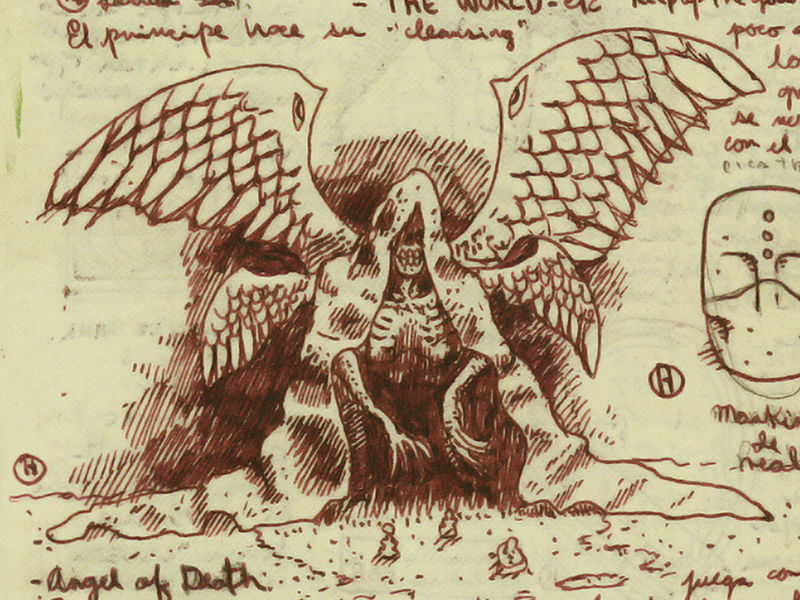 For more pictures of the Angel of Death, visit the Monster Gallery. 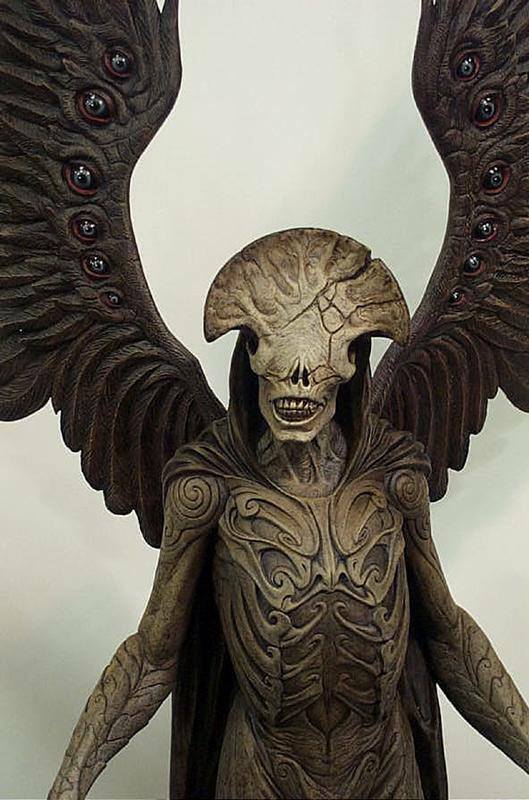 Posted on 12/07/2018, in Movie Monsters and tagged Angel of Death, Doug Jones, Guillermo del Toro, Hellboy, Hellboy II, Spectral Motion. Bookmark the permalink. Leave a comment.